DEQX technology is unique in correcting frequency-related amplitude and timing errors by adjusting thousands of frequency groups to different degrees as required allowing all frequency groups to arrive at precisely the right time. Audio and surround systems open up in a dramatic way when timing, phase and amplitude accuracy are restored and faithful to the original signal with room compensation added. The beauty of DEQX is that it makes even modestly-priced speakers sound amazingly like top audiophile brands; an exciting and dramatic upgrade for every system. DEQX works with whatever you’re listening to and results in breathtaking improvements. Modestly-priced stand-mounted speakers to top-tier audiophile brands all sound better with DEQX. "No way!” exclaimed Editor John Atkinson of Stereophile in Stereophile’s show coverage “Bypassing the DEQX Mate resulted in the squawky balance I would have expected from the horns, with no lows or highs. Switching the DEQX Mate back in-circuit gave a sound that was evenly balanced, with good HF extension and enough upper bass to sound convincing. Color me gobsmacked and you can quote me on that!" Audeze LLC is a California-based high-end audio headphone and accessory manufacturer delivering the most accurate sound reproduction available today. Audeze products are engineered with the latest innovations in materials science and technology matched with precision craftsmanship to produce an astonishingly dynamic and enveloping sound. Audeze’s commitment to research and development is reflected in every facet of our made-in-the-USA products. Raven Audio components are handsome, well-appointed tube integrated, stereo and monoblock amplifiers and preamplifiers, housed in solid-machined billet aluminum chassis with solid-bronze corner posts, stainless steel screws and chrome ball footers that isolate the amplifiers for better sound and avoid scratching your fine furniture. They’re hand-wired point-to-point with silver-plated PTFE-coated conductors and three types of solder. Choose from new or NOS tubes when ordering. Raven Audio products sound as beautiful as they look. "Raven Audio initially drew me into its room with Linda Ronstadt’s charming album “Canciones de mi Padre” disc playing through the Joseph Audio Perspective loudspeakers and RA’s Silhouette monoblocks and preamp (with built-in phono!) 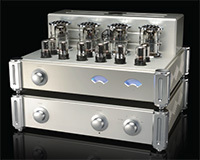 the amps use an all tube rectified power supply and can be biased for 655, KT88 all the way up to KT 120 valves. $13,000. Also on display were a stunning pair of integrated amps, the Reflection $6995 and the sweet, and petite Nighthawk(pictured above), a nimble 20Wpc at a persuasively blue-plate-special price of $1500."